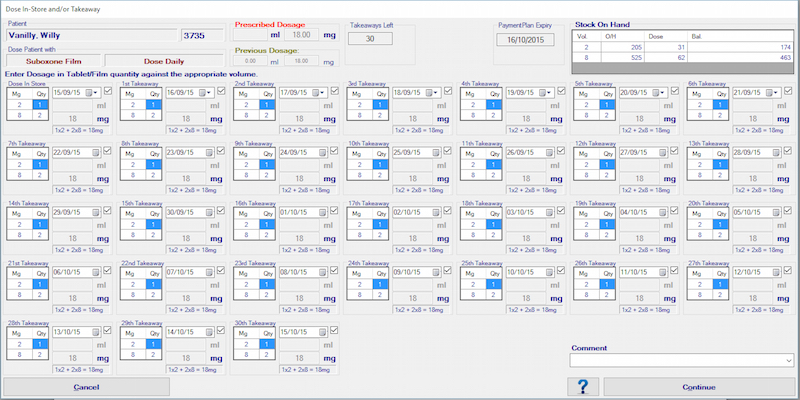 The Dose Patient Form is used to record a single in-store dose and up to 6 takeaway doses. if the selected patient has missed 3 or more consecutive days of dosing, if so, a warning similar to below appears prompting a certain course of action. 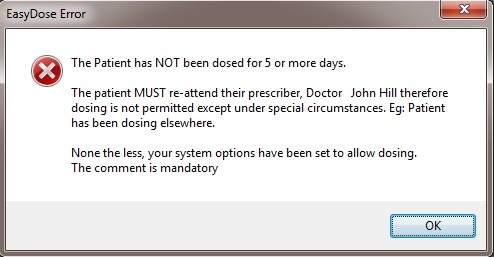 if a patient has missed 5 or more consecutive days dosing, if so, the customised message below appears. to see if there is sufficient stock on hand, if not, the balance field turns red. the number of takeaway doses left to be dosed for the week. if the patient has sufficient funds to pay for the number of doses (applicable only if System Options are set NOT to allow dosing if unfinancial). The system then populates the Dosage fields with either the last amount dosed or maximum amount prescribed on the prescription. This is called the Suggested Dosing. NOTE: The 3 day messages are customised in the Option Settings. If the following warning appears, clear the message and the Dose In Store Form will be enabled. Note, if the following message does not appear, the Dose In Store Form will open directly. The suggested dose takes into consideration the prescribed dose and the previous dose. If a previous dose is found, that dose is used. These amounts can be overtyped. When Methadone and Biodone Forte are to be dosed, the following form (F1) opens. When Subutex and Suboxone are to be dosed, the following form (F2) opens. All fields except the ‘Enter the Dosage ml’s or mg’s’ field(s) and the Comment field are read only. The Comment field is only applicable for the 3 day or 5 day warning. The Date field, which defaults to the current date, can be changed by ticking the “Override Date” option. The dosing date cannot be greater than 7 days in advance. A comment must be selected from the drop down list when a patient has not dosed for more than 3 consecutive days. For Methadone & Biodone Forte, an amount in ml’s is entered into the sole ‘ml’ field under ‘Enter the Dosage in ml’s’ heading. For Suboxone & Subutex, a break down of Tablets or Film is recorded in the ‘Qty’ column against the corresponding drug strength (Dose Mg) to reach a total of the amount to be dosed. The Stock On Hand grids appear different but have the same function. If you override the date, a scheduled date must be entered or a warning will occur. If the warning is ignored, the dose WILL have an adverse affect on the calculated and/or missed doses in the Health Department Monthly Return. If the new dosing schedule is different to the previously entered schedule, YOU MUST, reschedule the patients’ future dosing records via the Prescription Form. The dosage amount entered into the Prescription Form is the prescribed maximum and if the total amount of the daily dose exceeds the prescribed maximum, a warning will appear on the form and prevent the dosing sequence to continue. Warning is “Dose Exceeds Maximum” in red. The Continue button is disabled until the error is corrected. In the example message below, Takeaway Dose No 3 exceeded the prescribed amount. The Dose In-Store dose can be deselected so only Takeaway doses are recorded. Takeaway 1 is selected by default and cannot be deselected. The number of takeaways, corresponding to the number of Takeaway doses left for the week will be enabled. No less than 1 but up to 6 takeaways can be selected. The number of takeaways can exceed the number left/prescribed (explanations should be provided). When dosing is performed, the system checks if there is sufficient stock on hand. If not, the Balance field goes red. The Continue button is dimmed until the dosing error is corrected and more stock is added to the system. Note: This only applies if the System Options have been set to NOT allow dosing if unfinancial. The Continue button is disabled. Warning appears on page footer. Adding/deleting/modifying any further doses will trigger additional warnings. If Continue is clicked when the 3 or 5 day warning is invoked and a comment is not selected, the system will prevent dosing and warn the user accordingly with the below message. 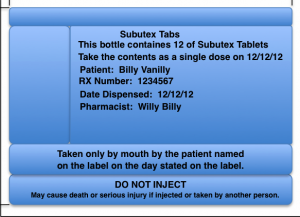 When the above conditions are met, the User will be prompted, on screen, for the Patient to sign for their dose. 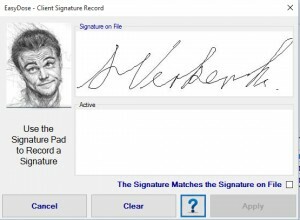 The patient photograph and sample image of their signature will be displayed on the computer screen for the User to view. 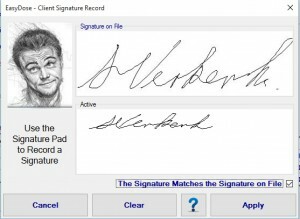 The Patient will be requested to sign on the signature pad. The signature will appear live as the patient signs. 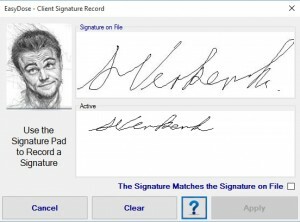 When the User is satisfied that the signature is a much, viewing the new signature against the sample, the User will place a tick in the ‘The Signature Matches the Signature on File’ tick box which enables the ‘Apply’ button. Click ‘Apply’ which will save the signature on file and the User will be prompted to verify the dose. 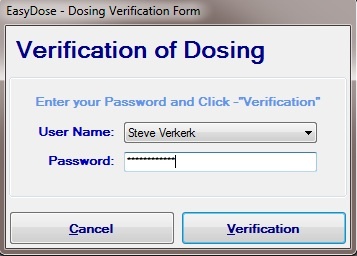 If the dosing record is complete and correct, the user will be prompted to verify their entry. Their User Name and Password will be required. See below. All Takeaway labels print automatically when dosing is complete. Settings in Label Type can be changed to print In-Store dose labels. Setting in Label Type can be changed to preview labels before printing. A label will be printed to match each corresponding takeaway dose. The following message will confirm the successful dosing. The dosing record will be immediately recorded in the Stock Movement Form. New South Wales allow up to 30 Takeaways for authorised patients. 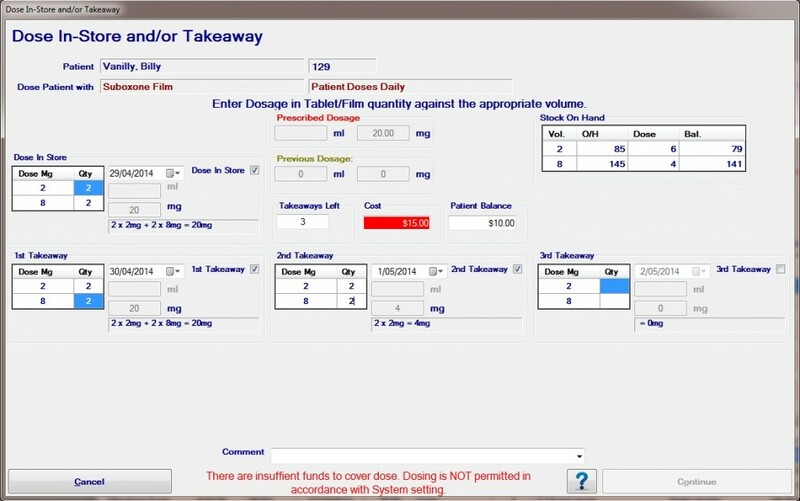 When such functionality is TURNED ON in System Options, depending on the Payment Type (Daily or Plan & Expiry Date) and the Prescription expiry date, the Takeaway from will populate with up to 30 Takeaways. Note: To gain access to this form three things should/must occur. Each individual patient must authorised to receive more than the usual limit. Enabled through the Patient Details Form.